THANKSGIVING RECIPE: WATERMELON CHECKERS - What About Watermelon? Like last year, my plan this month is to feature a new recipe each Friday. The goal, of course, is to arm my fellow watermelon lovers with ideas for dishes to create on Thanksgiving (whether you’re a host or a guest). Today’s recipe is an appetizer, which is one of my favorite parts of the Turkey Day menu. My in-laws make legendary Thanksgiving appetizers. So legendary, in fact, that I practically fill up on the apps before the meal is served. But I’m a trooper, and I manage to find my second wind in time for turkey, stuffing and mashed potatoes. If they served this appetizer, though, I’d probably polish off the entire thing and have to skip right to dessert. Cut equal size 1/2-inch-thick square shapes from watermelon and your favorite cheese. 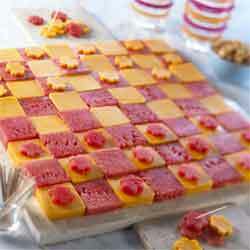 Arrange as a checkerboard on a serving tray. Cut small circles of the watermelon and cheese as the “checkers.” Enjoy, and try to resist the temptation to yell “King me!” every time you eat a piece from the last row. Watermelon Checkers, great app. idea. I might try this on Thanksgiving. I never know what to bring. As always, let me know if you make it and how it turned out. This is one of those recipes that can be customized and changed in a lot of ways to make it better and more fun!